RE/MAX Elite Commercial professionals’ experience and knowledge will enable you to clearly and quickly identify a course of action that delivers maximum value to your company or to your individual portfolio. Regardless of your needs, RE/MAX Elite Commercial practitioners have the skills and experience to find the best strategy - whether you're looking at a simple local transaction or a top-notch team to handle multiple-site acquisitions or dispositions across the globe. Your RE/MAX Elite Commercial professional is your single point-of-contact to the most responsive and results-oriented team of professionals in commercial real estate. Advisory services- Whether you’re a small business owner deciding between leasing, buying or building, an investor contemplating an exchange, or in charge of a major corporation in need of a creative way to bring real estate costs under control, a RE/MAX Elite Commercial professional can find solutions for you. Services include acquisition, disposition, asset management, valuation, financial analysis, lease audits and occupancy cost analysis. Development services include concept design, site location and feasibility, permits and approvals, bidding, construction and financing. Asset management- RE/MAX Elite Commercial specialists can develop and implement asset management strategies for a client using an entire suite of services, including leasing, property management, tenant retention and marketing. Auctions- Often overlooked, auctions can serve as highly effective approaches to maximizing return on certain properties and within certain markets. Auctions are powerful examples of a RE/MAX Elite Commercial team's focus on values. Brokerage services- We provide a full suite of services, including owner and tenant leasing, acquisition and sales, marketing and consulting, and investment analysis. Build-to-suit- When available commercial space doesn't match your specific needs, a RE/MAX Elite Commercial professional can skillfully guide you through all aspects of a build-to-suit project. Business brokerage- Whether tied to a real estate transaction or not, the acquisition or sale of a business can be effectively handled through a RE/MAX Elite Commercial professional, who will always focus on achieving the results you need. Consulting- RE/MAX Elite Commercial professionals help you identify and implement real estate strategies to the operation of your business. They work hard to understand the trends and needs of particular industries and apply them to real estate transactions. Feasibility studies- Does your real estate project make sense? Does your property meet your current and future needs? Through comprehensive analysis of corporate strategies and goals, a RE/MAX Elite Commercial specialist can help you determine which property is right for you. Financial and Investment analysis- Is your portfolio performing as expected? RE/MAX Elite Commercial specialists can help you evaluate your real estate holdings to maximize the value of your assets. Industrial- A thorough and timely comparative analysis of properties reveals the best options for purchasing, selling or leasing industrial space. These results are based on local and regional economic conditions, transportation access, work for capabilities, and other variables that affect specific properties and/or businesses. International services- With a network of commercial specialists worldwide and the real estate industry's leading referral system, RE/MAX Elite Commercial will guide you to a real estate professional with intimate knowledge of the local market and the wherewithal to complete your transactions with integrity and skill. Land- Whether for investment, long-term growth needs or immediate use, a vacant land transaction always hinges on obtaining an exact accounting of a property's history, future use and status in relation to current trends in local and regional government planning. RE/MAX Elite Commercial specialists, through experience and market awareness, can supply the guidance needed to ensure timely, successful transactions. Lease- RE/MAX Elite Commercial professionals have the negotiating skills to obtain the best possible lease terms. Whether representing the lessor or lessee, they pay strict attention to the effect the transaction will have on your business objectives and profitability. Management- RE/MAX Elite Commercial specialists assist you with the day-to-day operation of your property through consulting services or by helping you procure the services of an outside property management company. Market research- As industry leaders in their respective markets, RE/MAX Elite Sales Associates provide clients with the most up-to-date market information. Utilizing the best information available, these professionals provide sales price data, market lease information, demographics, comparative tax and labor costs, competitive analysis, vacancy and absorption rates, and other information. Office- Whether you are buying, leasing, selling or building, RE/MAX Elite Commercial Sales Associates help you make timely, cost-effective decisions. Up-to-the-minute market analysis reveals the best space and location in a lease or purchase. In a sale, you receive maximum return through a marketing plan grounded in a solid understanding of all pertinent market data, including the status of active leases and the level of improvements and amenities in comparable properties. Opinions of value- RE/MAX Elite Commercial specialists assist in determining the fair market value of your property through an "opinion of value." They inspect the property, consider various highest and best-use scenarios and compare the property to similar properties sold, leased and currently on the market. Property management- RE/MAX Elite Commercial professionals provide property management services for a wide variety of properties. Property valuation- RE/MAX Elite Commercial Sales Associates help clients identify and capitalize on commercial real estate opportunities. Retail- Stand-alone sites, downtown storefronts, multi-use complexes, strip centers, new or transitional malls, big-box power centers - whether located in a single market or across the continent - demand complete knowledge of demographic trends, traffic patterns and growth projections. RE/MAX Elite Commercial specialists, as local experts operating within an international network of independently owned and operated offices, can quickly compile and analyze the information you need to achieve maximum value in any retail transaction. Site selection- Determining the best location for your business requires in-depth knowledge of local markets and the ability to identify economic trends. RE/MAX Elite Commercial specialists are empowered with the information they need to anticipate opportunities, seize competitive advantage and execute the best possible real estate strategies. Tax-deferred exchanges- Whether selling raw land in favor of income-producing property or disposing of older properties with topped-out appreciation in favor of new ones, RE/MAX Elite Commercial specialists can help you better understand and take advantage of the benefits of a tax deferred exchange. 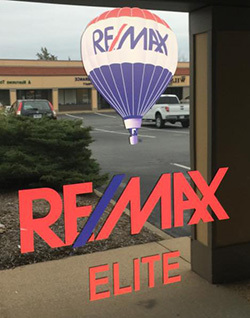 Tenant representation- RE/MAX Elite Commercial specialists are dedicated to providing clients with comprehensive tenant representation services that meet short- and long-term goals.